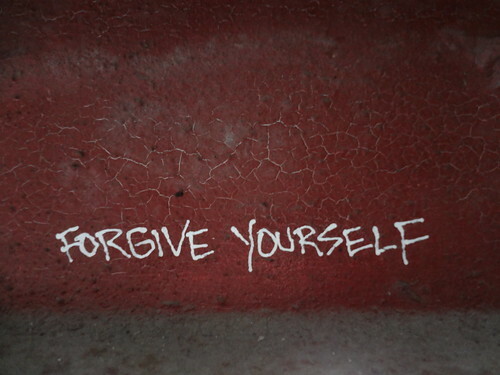 He Forgave You– Now Forgive Yourself Too. Regrets. Mistakes. We all have ’em. We’ve all made ’em. This week, we have been working through reasons why our hearts can be blocked and how we grow apart from Christ. (Click to read the original post here.) Yesterday was all about forgiving others… a hard but necessary topic. Today we touch on a subject that I feel is sometimes overlooked in our Christian world. Forgiving ourselves. Our hearts are really complicated. When you add our brains and flesh to our heart mixture, things can get super confusing… And kinda messy. Fortunately, God can clear things up for us. We can get stuck when we refuse to let it go and let God do His thang. When we hang onto our past sins, hurts, regrets and don’t allow God to take them… It is like we are saying that The Cross was not enough. Uh. Yikes? I think a mindset like that might be offensive to The Big Man! I sure wouldn’t be happy if I made the biggest sacrifice of my entire existence and somebody said it wasn’t “good enough” for them. Sheesh. So what do we do? We need to get over ourselves. Seriously. (Yeah, I said it.) Yes, we are God’s loving creation, but we aren’t better than The Cross. And we don’t have the power to mess up more than Jesus’ sacrifice can cover. We must GENUINELY believe with our heart, soul, mind and strength that The Cross WAS enough. God made a promise to us through His Son. The action of Jesus’ death on the cross FORGAVE us of ALL of our transgressions. Not just the little ones. Not the easy or simple ones. So today’s challenge for unblocking your heart is to FORGIVE yourself of any past hurts or hang ups. If you have accepted the Lord Jesus Christ as your Savior* then YOU. ARE. FORGIVEN. Do you struggle with forgiving yourself? Have you forgiven yourself in the past? What did you experience? Please comment here… I would love to pray and/or rejoice with you! Let God do the work. Give Him your hurts and regrets. He loves you more than you can imagine. Let it go and let God do His thang, covering you with mercy, grace and forgiveness. He has got it covered. The Cross did that for us. He Forgave you– Now go ahead and forgive yourself too.